NDC 24909-736 Cbdmedic Massage Therapy Pain Relief Camphor And Menthol. Proprietary Name: Cbdmedic Massage Therapy Pain Relief What is the Proprietary Name? Non-Proprietary Name: Camphor And Menthol. What is the Non-Proprietary Name? 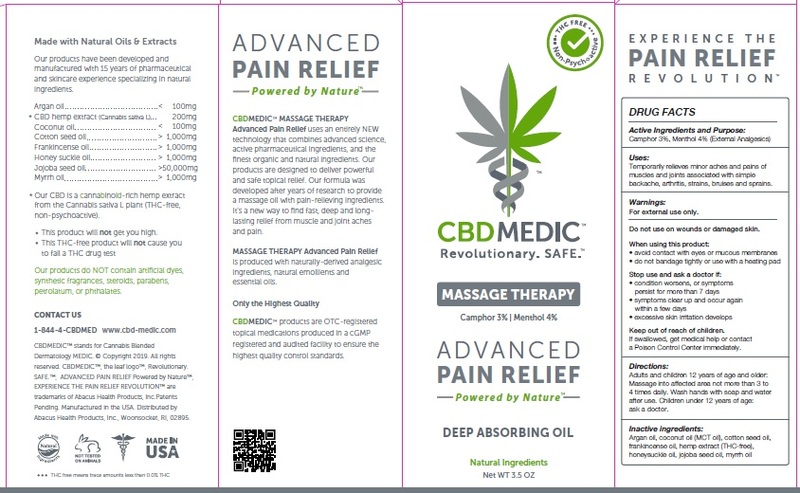 Cbdmedic Massage Therapy Pain Relief with NDC 24909-736 is a a human over the counter drug product labeled by Aidance Skincare & Topical Solutions, Llc. The generic name of Cbdmedic Massage Therapy Pain Relief is camphor and menthol.. The product's dosage form is oil and is administered via topical form. Dosage Form: Oil - An unctuous, combustible substance which is liquid, or easily liquefiable, on warming, and is soluble in ether but insoluble in water. Such substances, depending on their origin, are classified as animal, mineral, or vegetable oils. Start Marketing Date: 03-06-2019 What is the Start Marketing Date? Temporarily relieves minor aches and pains of muscles and joints associated with simple backache, arthritis, strains, bruises and sprains. For external use only. Do not use on wounds or damaged skin. When using this product: • avoid contact with eyes or mucous membranes • do not bandage tightly or use with a heating pad. Stop use and ask a doctor if: • condition worsens, or symptoms persist for more than 7 days • symptoms clear up and occur again within a few days • excessive skin irritation develops. Adults and children 12 years of age and older: Massage into affected area not more than 3 to 4 times daily. Wash hands with soap and waterafter use. Children under 12 years of age: ask a doctor.